If your Firmware is less than 1801, update your MOHOC to our latest version to improve performance, fix bugs, and add superior wireless connectivity to the MOHOC App for Android and iOS. We have different Firmware for each the MOHOC and MOHOC IR cameras. Make sure to follow the instruction and download the appropriate version corresponding to your camera. Follow these instructions to load the Firmware to your camera. Call MOHOC customer service at (208) 806-1391 if you have any questions and we can assist. Before you start make sure camera battery has 25% or more power and WiFi setting is OFF . MOHOC: Download the newest Firmware (file named MOHOC_Update.zip) to your computer. The new firmware inside the zip file is called sd_sr12ra.bin. 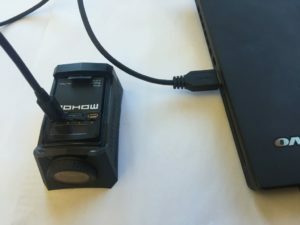 Connect MOHOC camera to computer with MOHOC USB cable and turn camera to ON. 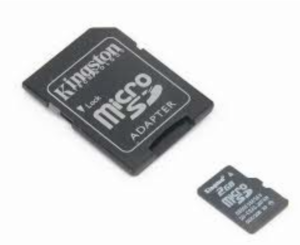 Or insert microSD card into computer using USB card reader. Or insert microSD card with SD card adapter into computer SD card slot. 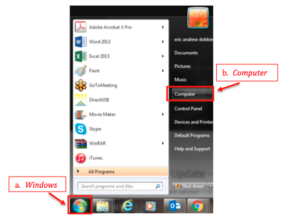 Locate the file – find the zip file you have just downloaded on your computer. There will be a zip file in your downloads folder. 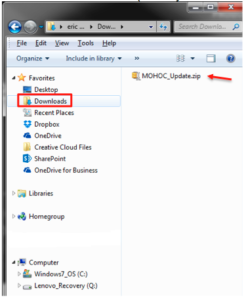 Unzip the file – you will see a file named “MOHOC_Update.zip”, double click on this zip file and the file will automatically unzip itself. Locate the updated file – within your downloads folder, a new file named “sd_sr12ra.bin” should appear just above the zipped file you just double-clicked on. DO NOT click to open or run this file on your computer. Move the “sd_sr12ra.bin” file to the root directory of your SD card – Copy and paste the file “sd_sr12ra.bin” from your computer Downloads folder to the root of the SD card. Place the file by itself and not inside any folders (image below). When connected to a computer the microSD card displays as Removable Device or MOHOC. If there are multiple versions of the Firmware file in your Downloads folder, select the one named exactly sd_sr12ra.bin. Do not use a version with a number sd_sr12ra.bin(1) or (2) in the name. Safely eject your SD card – locate your SD card (this may be found in your finder window or on your desktop as an icon) With the control button pressed down, click on your SD card and select “Eject”. Once card is safely ejected turn your camera OFF. Unzip the MOHOC_Update.zip file: right click on the file and choose “Extract”. Do not change the destination folder location where the files save. Copy and paste (or drag and drop) the file named sd_sr12ra.bin from inside MOHOC_Update folder to the root of the SD card. Place the file by itself and not inside any folders (image below). When connected to a computer the microSD card displays as Removable Device or MOHOC. If there are multiple versions of the Firmware file in your Downloads folder, select the one named exactly sd_sr12ra.bin. Do not use a version with a number sd_sr12ra.bin(1) or (2) in the name. Safely eject your SD card – locate your SD card and right click and select “Eject”. Once card is safely ejected turn your camera OFF. With the camera OFF, unplug the USB cable from the MOHOC or insert SD card back into the camera. Turn the toggle to left, ON position. If you turn the switch to the right (Recording) the Firmware will not load. Firmware upgrade starts automatically. Upgrade progress is displayed in % on the screen. Once the system reaches 100% wait 10+ seconds for the display screen to go black and the camera automatically powers off without any vibration. If your camera freezes at 100% and the screen does not turn OFF, then your WiFi setting was ON and Firmware didn’t load. See troubleshooting at end of the document to fix. Turn Camera toggle to OFF and wait 3 seconds for camera to shut down. Turn the toggle back to ON. Give the camera 30+ seconds and wait for it to automatically power OFF and ON as the camera needs to restart with the new Firmware. The firmware has now successfully loaded and is ready for operation! Reformatting your microSD card from time to time will improve your card and camera performance. Save any important videos or photos to your computer before formatting as it will erase all data from the card. We recommend you use the camera to format your SD card instead of your computer (found under the camera menu “SD Card” option). You can always confirm the Firmware version number in the Menu “Camera Device” option. Remove the microSD card and insert microSD card reader with the SD card into computer. Delete the bin file from the SD card. Insert battery and SD card back into camera and turn camera to ON. Go to WiFI settings option (second menu option) and turn WiFi OFF . Your camera is now ready. Follow Firmware loading instructions from step 1. If nothing happened when you tried to load the Firmware, you either already had the most up to date Firmware or you loaded the wrong model MOHOC firmware (MOHOC IR firmware on a MOHOC for example). Please check the firmware already loaded on your camera in the Camera Device menu settings and confirm the model of your camera and then try again. If your Firmware is less than 1801, update your MOHOC IR to our latest version to improve camera performance, fix bugs, and add superior wireless connectivity to the MOHOC App for Android and iOS. We have different Firmware for each the MOHOC and MOHOC IR cameras. Make sure to follow the instruction and download the appropriate version corresponding to your camera. MOHOC IR: Download the newest Firmware (file named MOHOC_Update.zip) to your computer. The new firmware inside the zip file is called sd_mohocir.bin. Unzip the file – you will see a file named “MOHOC IR_Update.zip”, double click on this zip file and the file will automatically unzip itself. Locate the updated file – within your downloads folder, a new file named “sd_mohocir.bin” should appear just above the zipped file you just double-clicked on. DO NOT click to open or run this file on your computer. 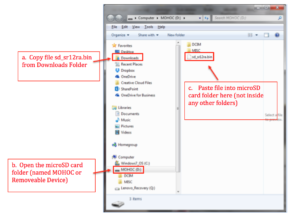 Move the “sd_mohocir.bin” file to the root directory of your SD card – Copy and paste the file “sd_mohocir.bin” from your computer Downloads folder to the root of the SD card. Place the file by itself and not inside any folders (image below). 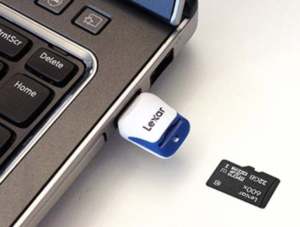 When connected to a computer the microSD card displays as Removable Device or MOHOC. If there are multiple versions of the Firmware file in your Downloads folder, select the one named exactly sd_mohocir.bin. Do not use a version with a number sd_mohocir.bin(1) or (2) in the name. Unzip the MOHOC IR_Update.zip file: right click on the file and choose “Extract”. Do not change the destination folder location where the files save. 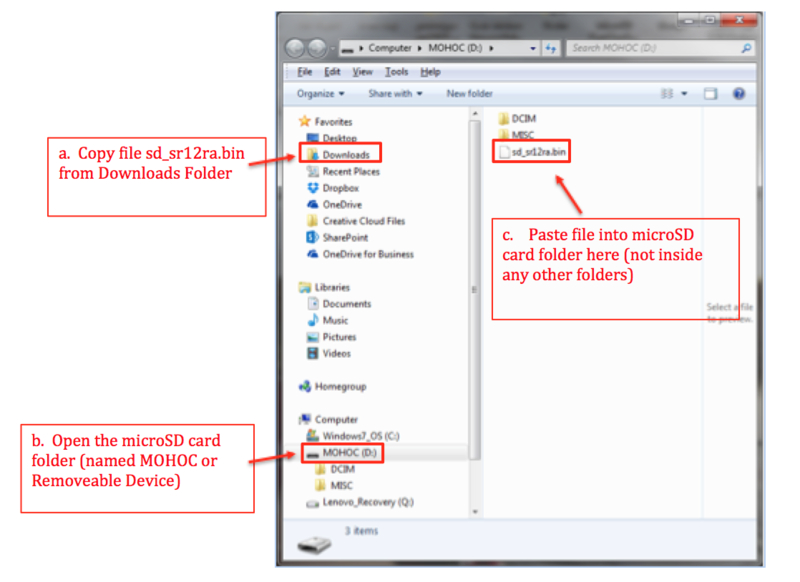 Copy and paste (or drag and drop) the file named sd_mohocir.bin from inside MOHOC IR_Update folder to the root of the SD card. Place the file by itself and not inside any folders (image below). When connected to a computer the microSD card displays as Removable Device or MOHOC. If there are multiple versions of the Firmware file in your Downloads folder, select the one named exactly sd_mohocir.bin. Do not use a version with a number sd_mohocir.bin(1) or (2) in the name. Still looking for some help? Send us a message and the MOHOC support team will follow up shortly to help.